We have always wanted the tranquility and peace offered by the Buddha statue, however didn't know how to get about it. 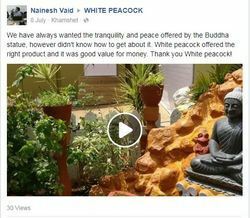 White peacock offered the right product and it was good value for money. Thank you White peacock! Beautifully carved with a lively face. Reached my place without any damage and on time. I highly recommend seller. I recently ordered a ganesh Idol from White Peacock and I must say that it was made with absolute perfection. I Idol was made as per the measurements and I could place it perfectly at my desired location. 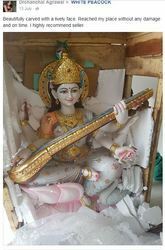 The communication as well as courier service was awesome and the Idol was received at comitted time.